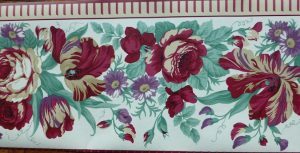 Waverly Magenta vintage wallpaper border. Deep Magenta with stylized flowers in Magenta, Rose, Deep Taupe and Green with Cream background. Broad bands of Magenta and Lavender with vines of Lavender, Purple and Green flowers on the top and bottom edges of the border. There is a narrow band of White on the top and bottom edges. Cottage style. Paisley pattern.